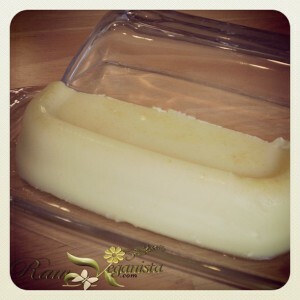 This raw/vegan “butter”/margarine recipe is not only quick and easy, but also free of palm & hydrogenated oils. The base is comprised of one of the healthiest (and most delicious) fats available: a very mildly flavoured, raw, unrefined coconut oil. Despite having been unable to eat any of my own experiments over the past few weeks (I have been fasting & juicing only), my “taster” assured me that this particular batch was divine and tasted “very much like salted butter.” This experiment was developed quite some time ago (when cooked food was still an option in my diet – it’s incredible on cinnamon toast & in brown rice), posted on the blog by special request, and is being offered as my gift to you in honour of Earth Day 2013. • 1 Cup raw, unrefined, virgin organic coconut oil. I used Living Tree Community’s brand, which is quite delicious with a very light (nearly nonexistent) coconut aroma/flavour. *please note: I suggest grinding even the “fine” consistency salt even further down with a mortar & pestle so that salt is a lighter, powdery consistency. Salt should be as powdery as possible for this recipe, to reduce sinking/settling during congealing process. Granular salt has a tendency to collect in one place, which will create an uneven flavour and texture in delicate, liquid-based recipes such as these. Important note: Coconut oil should be in liquid form. If it is a white solid, place a well-sealed container of it into a bowl of very warm water until liquification occurs. Blend all ingredients together in Vitamix at high speed, but be sure to keep from allowing the mixture to heat up (touching the sides of the carafe should help with monitoring any heat being generated during blend time). Place receptacle container into a bowl of ice water, then pour “butter” mixture in as soon as blending has finished (pouring it into a cold container will cause it to congeal quickly, which will keep the oil from separating from the salt and turmeric. Separation will kill this recipe, so please do be careful). Yields two “regular” sized sticks of butter (or kept singularly in a covered tub – I would use glass or stoneware), which can be stored for several weeks or longer in a refrigerator. I do not have a Vitamix. I do have a blender and a food processor. Would I be able to make this with either of these? Cheers for your question. Since having posted this recipe, I have received feedback from some people who have used regular (non-high speed) blenders and reported positive results. In fact, I’m actually considering making my next batch in a blender instead of the Vitamix. I would think it might be too messy for the food processor (mine doesn’t do so well with liquids). Your recipe looks fantastic!! I’m super glad to have found a vegan butter recipe without lecithin. Can we use your butter in recipes (crusts, making bread, etc)? Thank you for your comment! When still eating cooked food, I successfully managed to incorporate this recipe into pie crusts. I have also received positive feedback from friends who have reported that this recipe has worked well in their baking projects. Personally, I occasionally enjoy eating it in raw form with raw breads, porridge, etc. Is this butter good for a butter spread – to spread over toast? Looks very interesting. I am thinking of making an avocado butter based on this. If I do, I’ll post it on my food website and be sure to give you a shout-out. Do you taste the coconut in this at all? Greetings, and many thanks for your feedback! Please forgive my lengthy delay in response time – holiday chaos has kept me at bay over these past few weeks, so I’m just now working on playing “catch-up” with everything! When I make this recipe, I do *not* taste the coconut oil. However, I've only ever made it using raw & unrefined coconut oil from Living Tree Community Foods (which already tastes more "buttery" than coconut-esque). Results may vary with different oils, depending upon the flavour of those raw ingredients. I hope that information may be helpful to you in some way! I want to second the thank you for having a recipe that didnt include any litchien! When I did a search for its safety,it wasnt something I wanted to include in any recipe! So again,thank you so much! Hi, this looks great. Do you know if we can use this to substitute butter block in croissant making? Thanks for your question, for which I’m sorry to say that I honestly have no truly definitive answer. I agree with what you said. Most commercial margarines also contain chemicals derived from animals to hold them together. Which is a reason why we resort to vegan lifestyle anyway. Let’s see if this will work when I do get my hands on making them. One great challenge is the weather here (Malaysia), being hot and humid. Meaning I have to get working really fast after removing the block from the fridge. Sorry for the very late reply, I’ve been away quite a bit over the past several weeks & fell way behind with the blog. Thanks for this awesome…rawesome recipe! Is it possible to leave our the salt? Or is that required for chemistry? I would like to ask you whether you have tried to replace coconut oil with another oil – sunflower oil, for example. I look forward to hearing from you; many thanks in advance! I made this today using a very pure olive oil that was heavily infused with rosemary. I pulverized the Himalayan Pink salt. The result is nothing less than spectacular. Delicious spread on toast. Finally a non dairy butter that I can process myself! I can’t wait to drop some of this on steamed veggies, rice, vegan pancakes: oh my.. here come those holiday pounds! I’m sure this can be used (maybe without the rosemary!) in any baking recipe that coconut oil is used in. Thanks for posting this! You mentioned tumeric in your instructions, was that a mistake or did I miss something? Please forgive my delay in response. I’ve not had much time to spend online since the passing of my father, as I’ve been moving around quite a bit and dealing with family matters. In answer to your question, no other oil will work for this formula since the chemistry of coconut oil is quite different from others. It is the only oil which will “firm up” properly in cooler temperatures, therefore lending itself best to creations requiring a creamy or “buttery” consistency. There is absolutely turmeric in this formula. Perhaps you missed my explanation for this in the ingredients list? I am sorry for your loss; I hope that 2016 will be a year full of happy moments for you and your loved ones! 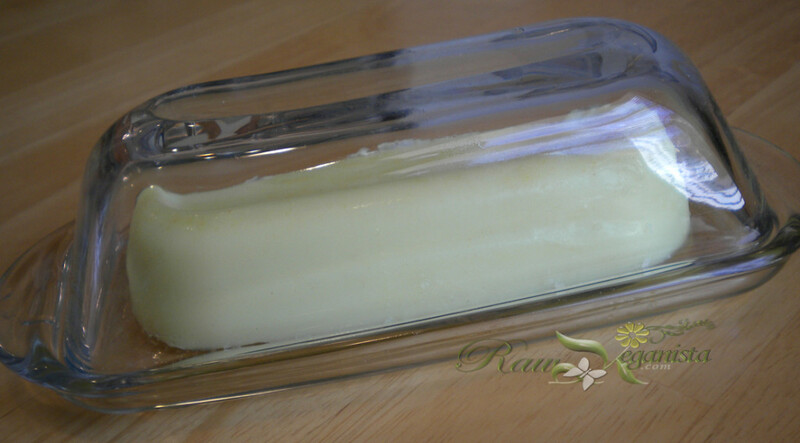 This is truly the best raw vegan “butter” recipe out there ! (but when I googled raw vegan butter I only got recipes with more intricate ingredients and instructions…..) This one should be accessible to all — since it’s so simple and amazing ! Wonderful on raw vegan pancakes and breads , so THANK YOU SOOOOOOO MUCH ! I am a little concerned about stabilizing the mold in the ice water. What do you use for a mold? Have you had an problems with the ice water (that the mold is sitting in) seep into the mold? Is the butter easy to remove from the mold? Would it be easier to have the mold and final container be one in the same? Thanks. Can this butter be canned into jars ? Thank you for your mindful question, and please forgive my late reply. I have been offline quite a bit, as access to Internet/blog/email has been somewhat limited for some time. To answer your question, I use silicone moulds. Most everything in my kitchen is either glass, silicone, wood, or ceramic. I have never had any issue with water seeping into the moulds, but am rather careful when handling things as they’re in the process of forming. Silicone can easily bend, thus making it relatively effortless to remove the butter once it’s formed. If you’re concerned about removal, I recommend potting it. I use brown stoneware crocks in my own workspace for applications such as these (cooling them first will help the butter to set more quickly and more uniformly) and quickly chilling it so that separation may be less likely to occur. Please pardon my long delay in response time. As outlined in my reply to the previous question (posted by Judith), it should be fine to pot it and I’m most inclined to use brown stoneware crocks in my own workspace for applications such as these (cooling them first will help the butter to set more quickly and more uniformly) and quickly chilling it so that separation may be less likely to occur. Wishing you the best of luck and health! Laurie, that sounds TOO FABULOUS and you are so very welcome! What you’ve done sounds absolutely amazing, and I am so incredibly grateful to learn of your positive results. I absolutely -must- try this method out for my own family! Thank you so much for your detailed feedback, which has added an amazing glimmer of helpful insight to this post. Be well, and may peace be with you.